When we make a purchase for any product we need to make sure that we are getting value for money. Paying a little extra for premium products can often influence us to choose a cheaper option, thinking that we may be saving money often leads to a short term solution. Eventually leading us back to square one and having to start the process over again. When you increase your budget you will discover a wider range of products that will offer you a higher standard of quality, where the finer details have been accounted for and a guaranteed long term investment is delivered. External blinds and patio awnings are the types of products that require us to make informative choices as this can be a costly addition to the exterior of a home. This is an outdoor luxury that will add value to a building and save money on both cooling & heating bills. Which is why it is vital to check the finer details, even when it comes down to the colour of the thread on the fabrics. Most external shading suppliers only offer one colour of thread on all their outdoor installations. As you can imagine an off-white thread is not going to match well with the wide variety of fabric colours and designs on offer. The reason many companies choose to offer only one option is due to the labour costs of changing the thread to match every order. With a large amount of orders coming in this can significantly increase the production time. This fine detail is one detail that can convey a lot about what a company means to you. Are they giving you the value that you seek? At Caribbean Blinds UK Ltd we always put the client first and tend to every detail to make sure that we deliver beyond expectations. Going that step further gives our clients full confidence in the extensive range of blinds and awnings that we manufacture. 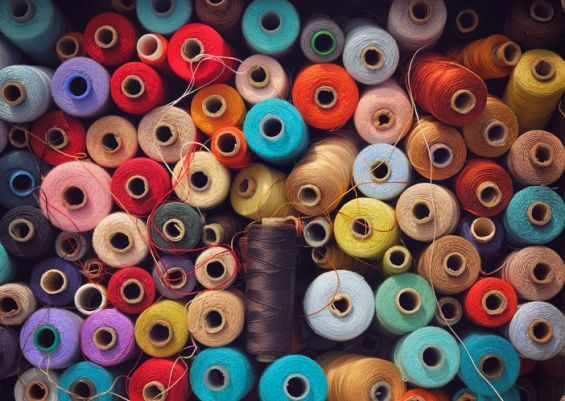 Our skilled designers and technicians are dedicated to ensuring that the finish of our products is to the highest standard, including colour coding threads to each fabric colour & design. This is one of the many fine details that we tend and is one of the many things that separates us from our competitors.